I recently had the pleasure of reviewing two albums (from different record companies) that used vintage pianos on loan from the same historical piano collection. I had no idea there even was a historical piano collection in the country. Because it is an important and fascinating place, here are some details about it from their brochure. 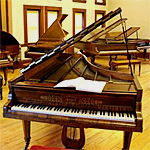 The Historical Piano Study Center, showcasing the Frederick Historical Piano Collection, is open to the public for individual and group tours. Its mission is to provide opportunities for listening to, playing on, and learning about the piano, as known to important composers and pianists from Mozart, Haydn, and Beethoven through Debussy and Ravel. The Study Center can provide a forum for lecture-recitals, master classes, seminars, panel discussions, and such, on matters concerning the relationship of compositional style and performance practice to the instruments for which the standard repertoire was composed. A tour of the Piano Collection takes three hours, due to the number and variety of pianos to be encountered, and the need to introduce each type with a few words, and with appropriate musical selections. Visitors may play the pianos. The Study Center is open Thursdays, 10:00 to 4:00; Saturdays, 1:00 to 4:00, and at other times by appointment, year 'round. In winter, to maintain optimum humidity for the pianos, the temperature is kept at 50°f. Visitors are advised to dress warmly. Appointments may be made by phone or by e-mail (piano.fred@juno.com). While there is no fee for a tour, the Study Center depends upon (deductible) freewill donations for maintaining its building and supporting its musical programs. The Piano Study Center is fully handicapped accessible. The Frederick Collection of historical grand pianos includes two dozen instruments by leading makers in Vienna, Paris, London, Leipzig, and the United States, from about 1790 to 1928. Each piano represents a major type known to and played by a specific composer or generation of composers and pianists from Mozart, Haydn and Beethoven, through the nineteenth to the early twentieth century. Established in October, 1985, the Concert Series is held in the spring and fall at the Ashburnham Community Church, 9 Chapel Street, at the corner of Main Street (Route 12). Concerts have included music for solo piano, piano duo, piano with violin and/or cello, lieder, and French art songs, performed by outstanding professional musicians. Each concert matches a single historical piano from the Frederick Collection to the repertoire best suited to it: For example, Chopin's music on the 1845 Pleyel or 1840 Erard; Brahms's on the 1868 or 1871 Streicher; Debussy's on the 1877 or the 1893 Erard or the 1907 Blüthner. The church, built around 1835 and renovated in the mid-1960s, is a light, airy space with superb acoustics. It can seat two hundred people and is fully handicapped accessible. The concerts, at 4:00 o'clock on Sunday afternoons in September-October and May-June, last about an hour and three quarters. Admission is $10.00 per person, children and students free. There are no advance ticket sales or reserve seats. To learn of upcoming events, either consult our Web site (http://www.frederickcollection.org) or ask to be on the mailing list. Fliers announcing concerts are mailed only twice a year, in spring and fall.